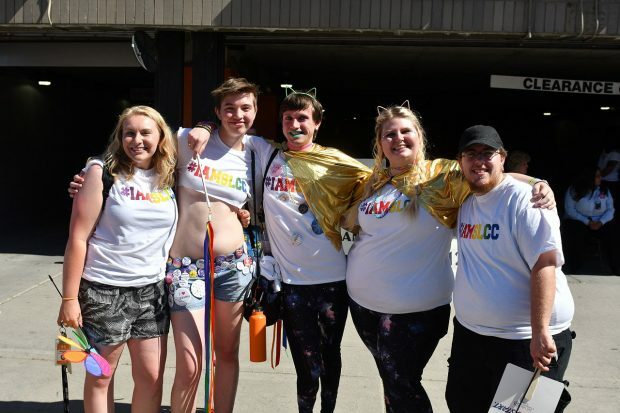 One club at Salt Lake Community College is working to provide a sense of belonging to all LGBTQ+ students and their allies. Formally known as Rainbow Pride and Coloring Outside the Lines, the Queer Student Association is, first and foremost, a “safe place for queer people,” according to club president Kyne Drystan. With a member base of more than 15 students, the QSA is in search of fresh faces. Beyond events, volunteering and social gatherings, Drystan wants the club to spread awareness and tolerance to anyone willing to listen. Meetings, Drystan says, feel more like get-togethers with friends. “When we had summer meetings, they would end at 3 o’clock, but most days they would continue until 4 or 5 [p.m.] just because we kept talking,” says Drystan. Drystan was looking for a group who would understand what he was going through. Being an openly transgender man, he was worried he wouldn’t find it at SLCC. “The first club meeting I went to, before I was involved, was just a room full of white gay guys – and I just felt I didn’t belong, so I turned around and left,” says Drystan. Drystan hopes that diversity will help avoid anyone feeling how he did at his first meeting. He wants a focus on recruiting diverse members this semester, but still welcomes all LGBTQ+ students and their allies at SLCC. He also said club members have plans to volunteer with Gender Revolution, a local LGBTQ+ awareness organization, and observe Transgender Day of Remembrance in November by holding a meeting on it. It memorializes those who have been murdered because of transphobia and pairs well with Drystan’s message of diversity this semester. In his experience, that was not always the case. Stories like his are still common, Drystan says, emphasizing the importance of these clubs as a way to make connections and share experiences. Club meetings at the Queer Student Association are held Mondays at 2 p.m. in the basement of the Taylorsville Redwood Campus in Den 1 or Den 2.